In my business of helping men create a happier, more sexual, more intimate marriage relationship, I sometimes have to tell men things they don’t really want to hear. One of those things is when I have to tell men that they are causing their wife to be attracted to other men. It’s these two statements that I want to discuss in this article…and thereby help you create a stronger, more secure, happier, more sexual marriage relationship. What you give positive energy to grows and what you deprive of positive energy dies. When you give positive energy to your marriage relationship, it can grow. To give positive energy to your marriage means that you give it time, attention, and care. For your marriage to be successful, you must nurture it. But, you already knew this. Therefore, it is time for you to START DOING what you know you should do…if you don’t want your wife being attracted to other men that is. Okay, let’s go to the next statement… What I am about to say will probably be a revelation to you…an insight into a woman’s mind that has never occurred to you…along with the high cost you are paying for your ignorance. First, never, ever, ever whine, complain, or gripe about how “oppressed” you are at work. It is because a MAN doesn’t complain or whine. Little boys complain and whine. MEN don’t! A mature woman is not attracted to little boys…she is attracted to a MAN! In the context of a marriage, there is absolutely nothing about complaining and whining that endears a woman to her husband. In a woman’s mind, if things are really that bad at work, then BE A MAN AND DO SOMETHING ABOUT IT! Otherwise, stop crying about it like a little boy. Second, never, ever, ever whine, complain, or gripe about your boss. In a woman’s mind, to do so merely makes you look weak and your boss strong. In other words, to complain and gripe about your boss makes HIM more ATTRACTIVE to your wife and YOU LESS attractive. There are men everywhere who come home every day of the week complaining about their boss…boyishly wanting sympathy from their wife…and they don’t even realize that all they are doing is CAUSING THEIR WIFE TO HAVE SEXUAL FANTASIES about another man…their boss. So, if you are coming home and complaining about work and your boss, then the price you are paying is to turn your wife off towards you and on towards another man. Now, it may not be your boss…it might be some other man that you are griping and complaining about…but I can assure you that negativity on your part will ultimately cause your wife to be attracted to other men. 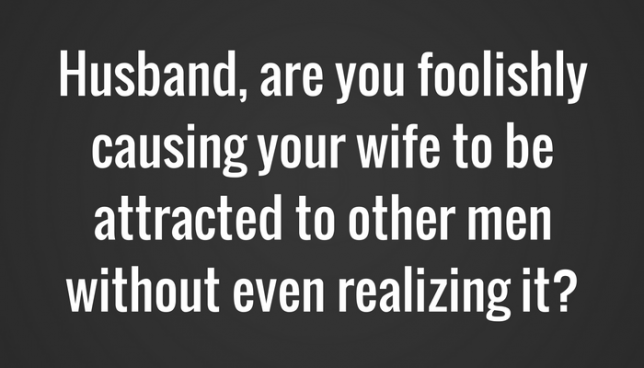 Negativity on your part will ultimately cause your wife to be attracted to other men. …do you need to make some changes?